Update 2019 on Best Deck Cleaners Please read this article and post any questions you have in the comment area below our article. 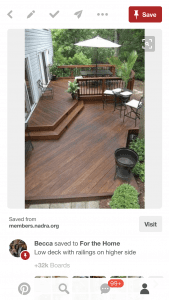 Our newly enhanced website now offers the ability to upload and post pictures of your exterior wood or deck so we are able to answer any questions you may have on prepping your deck and using a deck cleaner that will work well and without damaging your wood. In this article, we are going to cover what actually is “Wood Deck Cleaner”. 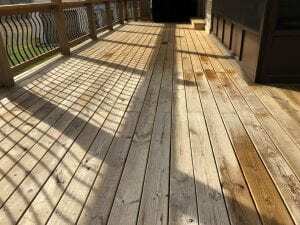 We will compare the different types of deck cleaning options available and what are the positives and negatives of each. Exterior wood and deck cleaners are designed to clean and prep your exterior wood prior to an application of a wood stain. These cleaners come in many different concentrates with different ingredients. The main purpose of deck cleaners is to remove contaminants such as dirt, oxidation (graying), mold, algae, and in some cases, a very deteriorated stain that has failed. 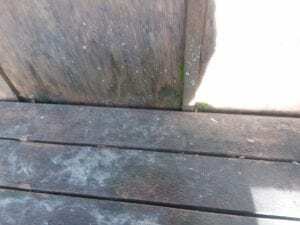 Deck cleaners are typically made up of caustics soaps that will aid in the scrubbing or pressure washing of your wood during the prepping process. 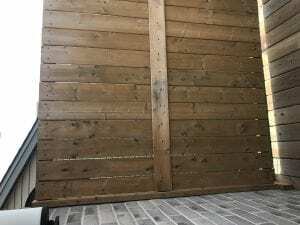 Most deck cleaners will raise the pH balance of the wood resulting in a neutralizing acid (deck brightener) application to cancel the caustic of the cleaner, leaving the wood in a neutral state. Note: Deck cleaners are not designed to remove old stains. You would need a deck stain stripper for this. Oxygenated based deck cleaners have really taken hold in the last 10 years. These cleaners contain the active ingredient Sodium Percarbonate. This is a registered ingredient by the EPA for mold and mildew removal. 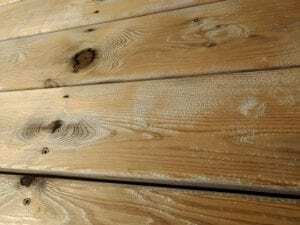 Deck cleaners that contain this ingredient will also contain additional surfactants that will “boost” the overall effectiveness when cleaning exterior wood. These cleaners come in powdered concentrates that are mixed with water then applied to the wood’s surface. Best applied with a garden pump sprayer then scrubbed or lightly pressure washed off. Pros: Environmentally safe and effective cleaner. Registered mold removal by the EPA. Very cost effective. Excellent at the removal of contaminants. Cons: Must be mixed with water to the desired concentration. Only active for 30 minutes. Some need warm water for best results. Many of the older deck cleaners contained the active ingredient called Sodium Hypochlorite or what is commonly known as “bleach”. These deck cleaners will contain bleach that “whiten” the wood and some additional soapy surfactants that will aid in the cleaning of dirt and grime. 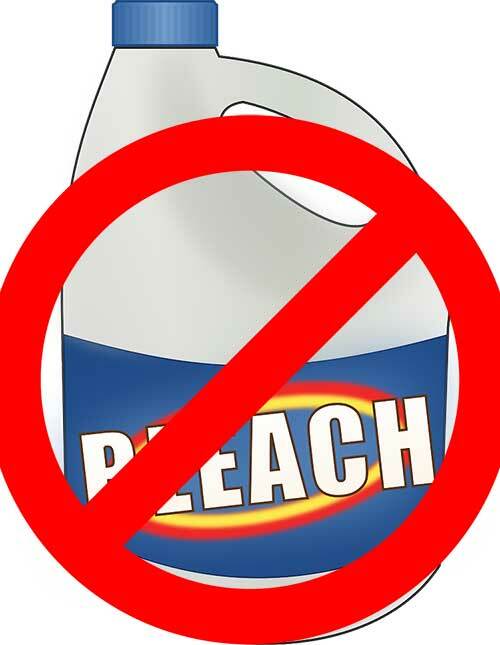 Bleach-based cleaners have recently been found to damage the wood’s lignin that will help bind the cellular structure of the wood. Pros: Premixed in liquid form. Excellent mold and algae remover. Cons: May cause damage to the wood cells. Average cleaner. We really like the “Oxygenated” Deck Cleaners. Since they come in a powdered form they are much less expensive. When you have the combination of Sodium Percarbonate and the proper surfactants, your cleaning will be easier and the end result will be hard to beat. *Remember, the better the wood is prepped the longer the life of your stain and the overall appearance will be improved. What psi power washer is best for deck cleaning? It is relative to how close you are when washing the wood. You can use a 3500 psi pressure washer but if you are 8-10 inches away from the wood, you will wash at half that pressure which is fine. If you were 1 inch away, you would gauge the wood. Last year I applied RAD cleaner and brightener to a new cedar deck and then stained with AC cedar semi transparent stain. It has worn a little and I’m going to restain it. Do I need to clean AND brighten again with RAD before staining or just clean and stain? My dock needs cleaning. It is already in, sitting on aluminum posts and crossbars. Will I damage the aluminum with the deck cleaner? We have a 20’x20′ 19-year old pressure treated deck that has never been stained. Pictures attached. We receive full south facing sun most of the day. What do you recommend in terms of treatment and stain? Sand and then wash? Thanks in advance for any advice and help. No need to sand. Clean and brighten for the prep. 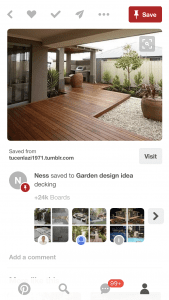 Use Restore A Deck Kits. Stain with a penetrating semi-transparent stain like the Armstrong Clark or Restore A Deck Wood stains. 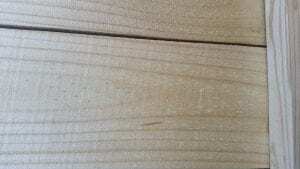 What is the best stain for composite decking? 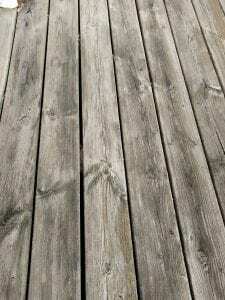 The decking is old and we do not like the color? How would we prep it, I power wash it and it looks clean enough to apply a product. Sorry, but we have not stained a composite deck in over 10 years. Not sure what will work well in 2019. I had a guy pressure wash my 1 year old deck today so I can stain it. He used a soap and bleach mixture and said deck wash is just bleach anyway. Now my deck looks more white than natural wood color. Half my deck is covered so it still looks new. He’s willing to do whatever he needs to do to fix it. Can you make a recommendation to correct this. It’s white and sticky and has many wood fibers and fuzz on it also. How transparent of a stain should I use also so it matches where its covered and uncovered also. You can see the difference in the pics if they uploaded correctly. To help even out the color, clean and brighten the wood again with the proper prep materials. Look at Restore A Deck Kits. Let dry and stain with Armstrong Clark or Restore A Deck Wood Stains. It will even out. Clean and brighten the part that still looks new under the covered portion also? Thanks for your help and just to be clear should we clean and brighten the entire deck including whats covered and still looks new? It is an oxalic acid dihydrate/enzymes based cleaner. Safe for wood and most exterior surfaces. It used too. We will update the article. Oxalic acid is a brightener, not a cleaner by the way. Had our 1 year old cedar deck cleaned and stained this spring. By summer it is filthy and looks like we poured dirt on it and let it sit there. Obviously needs a thorough cleaning again but wondering if we used the wrong stain. Used Sherwin SuperDeck oil based sem transparent Deck stain. Switch to the TWP 100 Series after or Restore A Deck Wood Stain. Our deck was built over a year ago and we let it weather. Yesterday we cleaned it with Olympic brand deck cleaner. One of the sprayers we used had a faulty valve and it sprayed unevenly and now we have bleached out spots in those areas. The rest of the deck looks fine, but those areas are very mottled. What should we do? Do we need to sand it? Reclean it? How well does the water based Restore a Deck stain work on Ipe decks? It has been untreated for 14 years. I plan to use a power washer with a Deck Cleaner and Wood Brightener first. Assume for best results I should also sand it? Thanks! Actually works very well. Easily can be cleaned and reapplied annually. Just one coat of stain. No need to sand it. We have a cedar deck that we would like to prep for staining. We just installed a powder coated aluminum railing. What deck cleaning product would be safe to use that will not damage the new rail? All railings of these type are manufactured differently so there is not one brand of cleaner that is going to be okay in every scenario. The only way to know for certain is to test first to confirm there will be no reaction. My deck is not wood and has a few big stains from sun screen. What can i use to remove then? The regular solution we used with the power washer didn’t work. I appreciate any suggestions. Thank you. 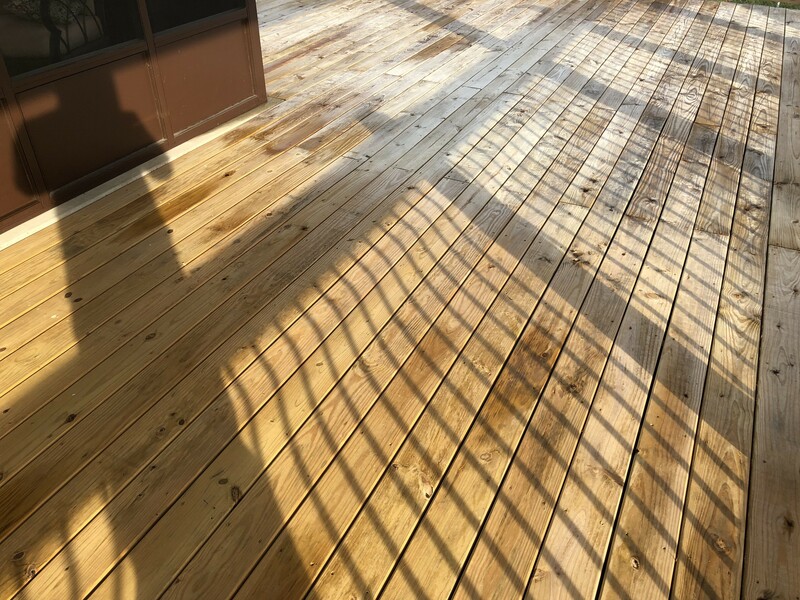 You will not be able to remove sunscreen oil out of wood with a deck cleaner or wood brightener. Not sure if anything will work. Hi, first time home owner. do I need to clean and power wash my deck? Please see attached photos. Any suggestions will be highly appreciated. Thank you. 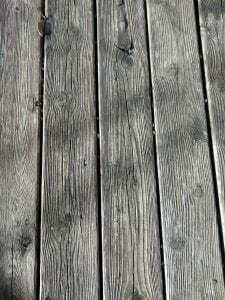 I used restore a deck cleaner and brightener today on my one year old unstained cedar deck. I plan on staining it next week with Armstrong Clark oil based stain. I vigorously scrubbed the deck with a stiff brush then went over it with a pressure washer as recommended then scrubbed again and rinsed. After applying brightener, my deck is still blotchy with white spots, particularly around area with knots, but also in other areas too. Do I need to repeat the cleaner scrubbing and brightener process, or can I stain it as is? 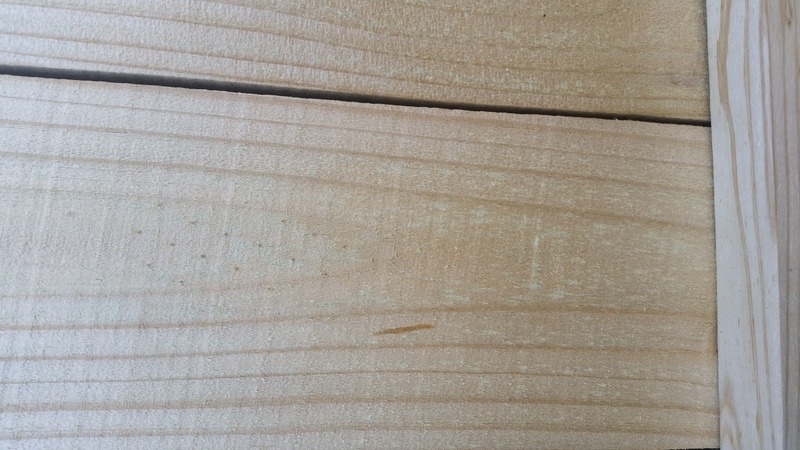 That is oxidation of the wood fibers that did not come off fully. It typically does not show when stained. We have decided to sand the spots off with 80 grit. Should I reapply the cleaner and brightener afterwards to “open the pores” of the wood? We are spot sanding the discoloration off with 80 grit. Do we need to reapply the cleaner and brightener after to “open the pores” and prep the mood for stain? Our friend has a cabin that has some black mold and moss on it. What would be the best product to clean it and prep it for staining. Try the Restore A Deck prep products. 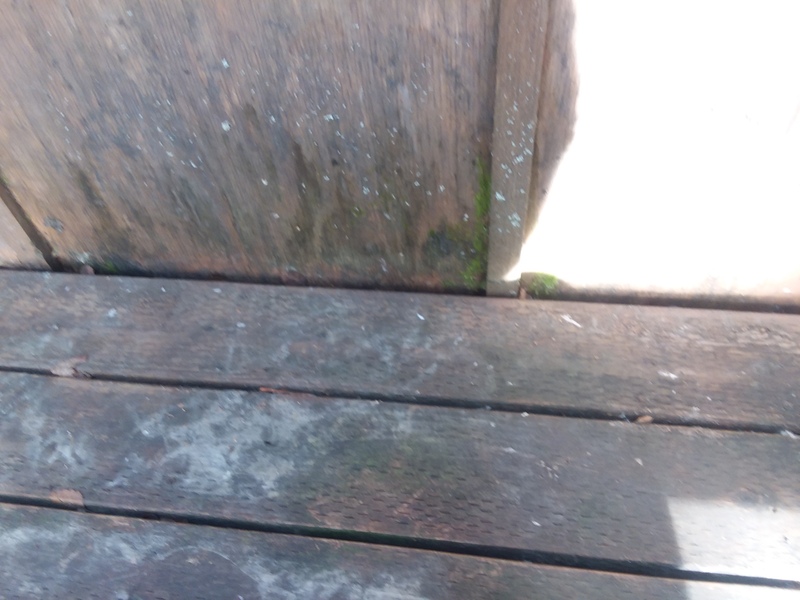 I need to clean my deck which has no stain, has green mold in some spots and gray in color. I also have shrubs and flowers at the end of the deck. My question is will this hurt my plants? Is it okay to do now or should I wait till fall? my deck has been stained with TWP cedar and now it has to be cleaned. What an I use that will not ruin the cedaar that it has on it. Try warm water with dish soap. Use a soft brush like the ones you used to wash your car. I had new pressure treated deck boards put on last summer but did not get around to staining them. I had it power washed this spring, but had a outdoor rug under a table at the time. Now, after I sold the table and rug, I have a big rug mark where the rug was. I also still have some pot marks left after the power washing. What do I need to do to the stains to remove them. You cannot remove water stains from the pots. Thos are permanent. as for the rug area, leat all wood season exposed for another few months and then clean brighten the wood. It should even out. Before I found your site I used a mix of tsp, Clorox and water and then pressure washed my old pressure treated pine deck. It came out looking very good. Is it now ready to stain after letting it dry out several days? It is not the optimal way to prep but it should be okay to stain. Thank you for the reply. Next time I’ll know better. We have a 1 year old cedar deck that has never been treated. My husband wants to apply Thomson’s water seal in cedar and therefore started to clean the deck to prep (he just wanted to brush it off but I insisted it be cleaner). We bought CIL Scrub-Free cleaner from HomeDepot . Didn’t realize it was bleach-based until he started using it. It seems to have cleaned in some places and not others so the deck is now very mottled looking. Package says you can apply again if needed and that you may have to scrub for a very weathered deck. But after the initial results, am worried about doing a 2nd application. Suggestions? Use a preopper deck cleaner and then pressure wash it off. Brighten the wood after. 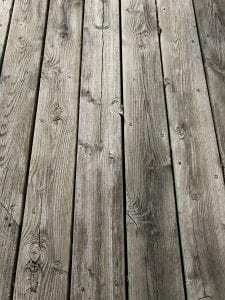 I have cedar deck that l have used oil base stain on then put a coat of linseed oil on has lasted 3 years but need to be cleaned and stained again what should be done to make the deck new again. It would be best to strip it down. Use the Restore A Deck Stripper and Brightener Kits. We put a cedar deck on last summer and then put a sealer on it. It did an awful job and the deck looks awful. I don’t think the sealer soaked into the wood much. My question is can we use an oxygenated cleaner on it lightly sand it, again, and reseal it? If so what kind of sealer do you suggest? Thank you. No, you have to fully strip and sand to remove the caoting that was applied last year before adding anything else. 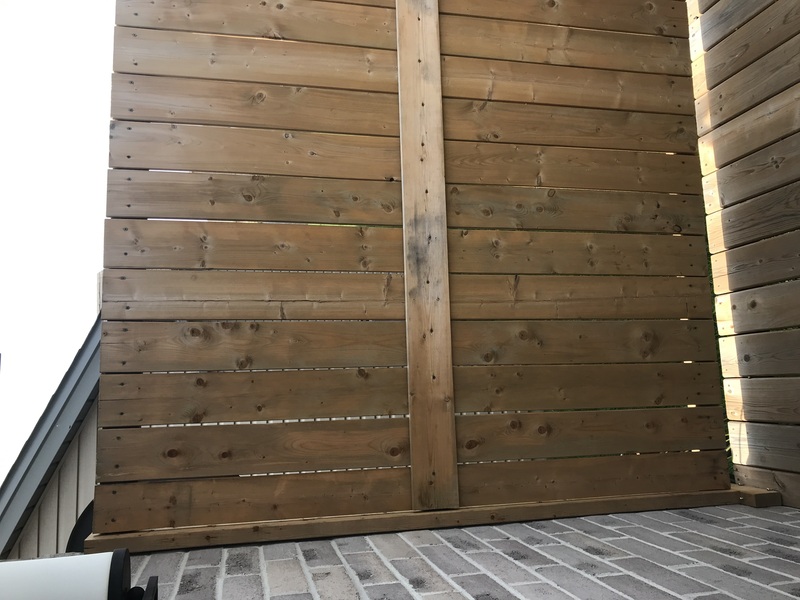 I am looking to prep a pine pressure treated fence for stain that is about 6 months old with no previous stain and I am curious if a cleaner will remove these white/almost green tinted spots on the wood. 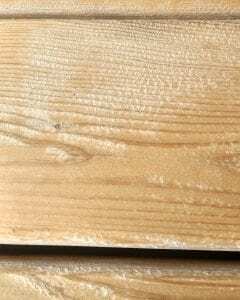 Is it a natural part of the wood or is it something that should be cleaned off prior to staining? It doesn’t appear to be mill glaze. Wasn’t sure if that was also part of letting the wood season longer and that it would fade away. I have been advised oxalic acid will remove the green tinting so not sure if that type of cleaner would remove it. 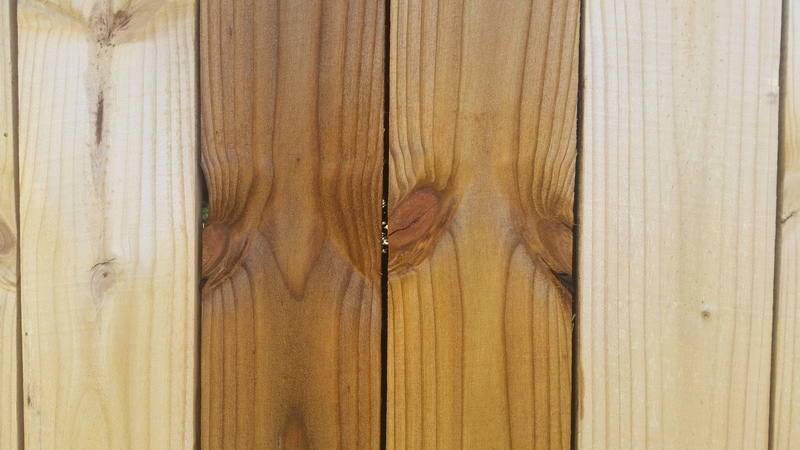 Also, is it recommended to do any light sanding on the fence prior to staining? Or mostly just cleaner/brightener/pressure wash is all you need to do for prep for the best stain outcome. Thanks I appreciate the help. For prep, you should clean and brighten the wood anyhow. if it does not come off, I would not worry about it too much. White spots will go away when stained and the green is most likely internal if it does not come off. No need to sand the wood. Thank you for the feedback. Looks like the stain hides it well enough. I wanted to ask in regards to the picture attached, is the lighter stain spots in the middle of the wood due to not enough stain in those places? I was just curious if there is any way to prevent that to have a nice finish on the stain. I’ve seen pictures where it seems to be common to have lighter spots next to the character marks on the wood. That is normal and is related to how your wood is absorbing the stain. Nothing you can do about it. Just wondering what the stain color is that you’re using…nice. 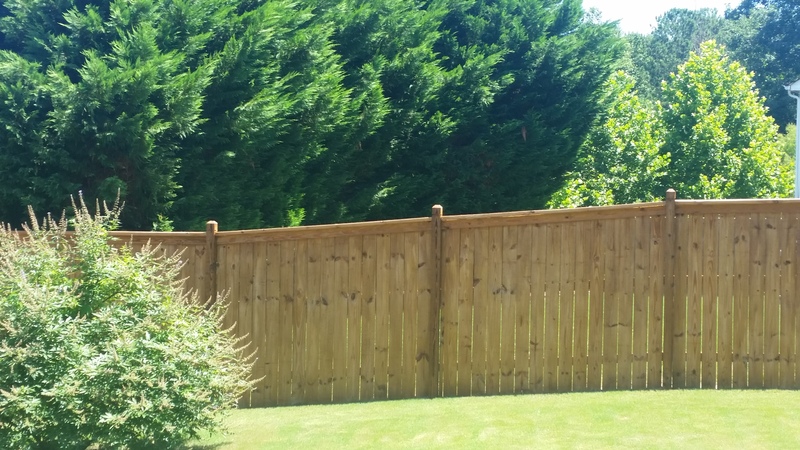 Is the fence pine? Thanks, it’s Pine. Ready Seal. Pecan (Left), Light Oak (Right). Went with light oak. We own a stationary camper surrounded by a ten foot PT wood decking on three sides. The previous owner cleaned the deck with a pressure washer and Clorox yearly. The wood is “furry” and splotchy with a moldy area on the front deck where there was a deck rug. We have removed the rug and cleaned the deck with a water hose and a oxiclean, water, dish detergent and Murphy’s oil soap mixture to clean and rinsed with water. It is somewhat cleaner but the knotty wood areas are now whiter and the deck is splotchy. Our camper and deck is covered by a canopy. I have read your articles and forum but remain confused. Help!! Thank you so much!! My husband prefers to clean yearly and avoid sealing. Please advise. I have some mold on a stained (semi-transparent stain) and want to clean the off the mold without damaging the stain. What do you suggest? Most likely not possible to remove just the mold without having some effect on the stain but it does depend on the brand and type of stain you used? We need to clean & stain deck rails of an upper & lower deck, as well as the floor joists of the upper deck, and replace the rotted floor boards of the upper deck with composite. The upper deck is a second story deck directly above the lower deck. And The Lower deck floor already has composite floor boards. What order of steps would you suggest? Our 3 concerns: accessibility to the upper floor joists to clean & stain, safety while working on the upper level (w rotted or no boards), and harm to the composite boards on the lower level from any cleaners or stain. 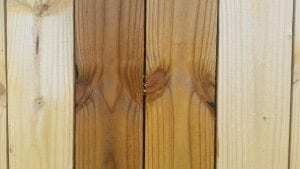 Is there a wood cleaner we can use that will not harm the composite decking? Use the Restore A Deck prep kits. Will not harm the composite. You will need to tarp when you do the staining to catch any drips on the lower deck. Prep and stain all after install of the new floor. I have a significant mold problem on my deck after using TWP1500. The time line was: New PT southern pine deck in April ’16. Let it weather until Early Oct. ’16 then used your recommended oxy cleaner and neutralizer. Let dry a week the stained with 1500. in May’17 i put on a second coat of the stain. Splotches of mold started to appear in September ’17. Deck is now a total disgrace. Is there a product I can use that will remove the mold without damaging the stain? BTW: I live in eastern Massachusetts. TWP has an EPA registered preservative that stops mildew from growing “in” the stain so most likely it is on top of the stain. This could be a result of tree pollen during your application in May as we have seen this to feed mold growth. The issue is you cannot just clean the mildew/mold without having some effect on the stain. We would suggest doing a deep cleaning in the Spring and a light recoat after. I live in Maine. I have a pressure treated deck that is 7 years old. It has never been stained or treated. It does need to be cleaned pretty bad. What would you recommend? 1.) Alaskan yellow cedar raw wood 1 year old prepping for first staining. Owner has given me olympic premium deck cleaner. Research and such shows lots of people having to sand after this product is used. Please advise a good product to use to not sand or scrub if possible. I still need to brighten after as well.. Correct? Your recommendation on that as well please. Your stain choice as well please… Maximum protection of original color while staying semi transparent or less. 2.) New red cedar fence with alaskan yellow posts. Clean and brighten new lumber to stain prebuild? Or can I just stain. Please advise product here also if not same as above. I am also wondering what manufacturer and color stain you would recommend to imitate IPE color on the cedar while staying semi transparent or less as well. We have a cedar deck that we put a Sherwin Williams clear coat on. We were hoping this would maintain the Cedar color. We were wrong. Now we are planning to place a natural cedar stain on the deck. What do we need to do to the deck to properly clean it and make it ready to receive the stain? Our deck clear coat is 1 yr old. You have to remove the SW fully first. Which brand of SW did you use? Do you have a picture? 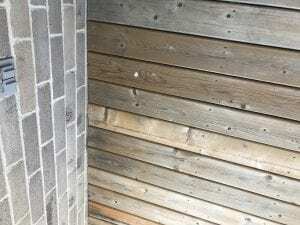 Northern MI home – Treated lumber deck installed last year but there wasn’t the proper timeframe to permit applying a stain prior to winter weather. Need to stain this year. 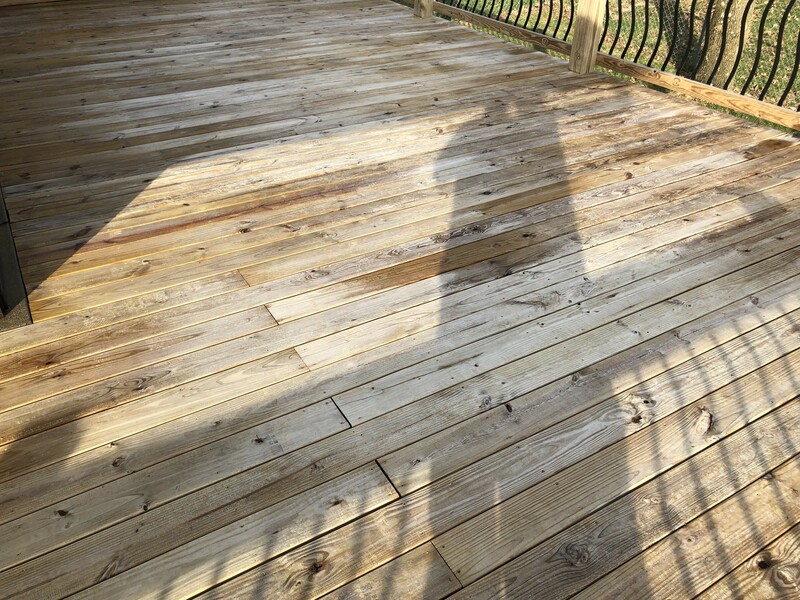 Deck located on North side of home – noticed some mildew spots and purchased Pittsburgh Ultra Deck wash to prep prior to applying their premium stain. Followed the instructions explicitly. Unfortunately, during cleaning process I have a white, almost gummy film forming on the deck. Used a brush for cleaning and during rinsing using hose/sprayer. After it has dried now 12 hours, white film appears as a coating that I believe will interfere significantly with the stain penetration. What do I do next? This is oxidation (graying wood cells) that you are not fully removing with the prep. Using a scrub brush is not going to be sufficient. Reapply a deck cleaner and pressure wash off. 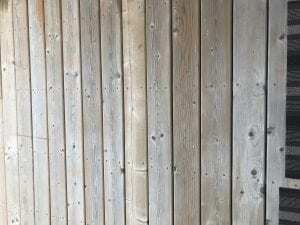 We have a vacation beach house in the Puget Sound (WA) that has cedar shake siding. The shakes are at least 30 years old, possibly 40. They have never been stained but they may have been treated in a clear coat (fire retardant?) in some places. Those areas foam when sprayed with water. We want to clean, restore or do whatever is needed to make the sides in the various locations more close in color. Right now we have silvered, and natural cedar, and areas as dark as coffee, with 3 stories and decks in multiple places. HELP! We do not have the resources to need to re-do this in two-three years. We have mixed opinions on leaving them natural, staining with semi-transparent or just priming and painting with house paint. It will depend on how good it looks after we work on it. Preeesure wash all and use the Restore A Deck prepping kits. If you want to stain, look at TWP 200 Series after the prep. Just starting process of cleaning and re-staining my cedar deck. I have approx. 600 sqft of deck with southern exposure on Lake of the Woods cabin in Ontario previously stained with Sikkens DEK. Stain has held up reasonably well and will likely go back to same product. What is your recommendation for cleaner/brighter? 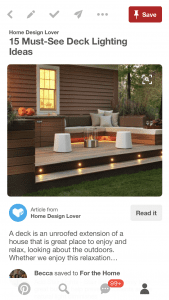 Try the Restore A Deck Kits. Live in a townhome complex that requires decks to be maintained every 3 years. My turn. 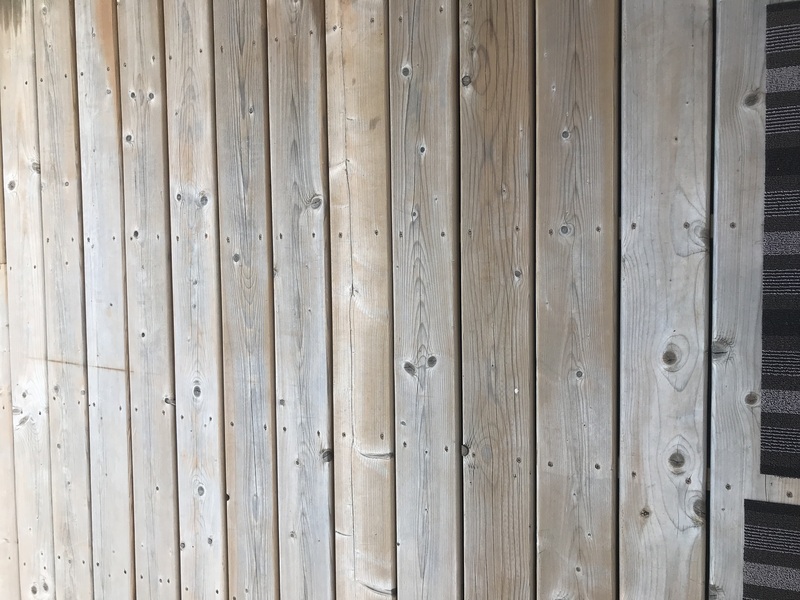 So it’s been 3 years, there are some worn and very weathered spots, mold, but the deck is structurally sound and I want to get the old stain removed especially off the railings and restore it as best I can. But I don’t know which order to do it all in. IF I decide to sand, that would be included in the process. Clean, sand, brighten, stain??? What order do I do this all in? Strip (not a cleaner), sand if needed, brighten and then stain. Thank you so much. No one ever makes the process clear. Love this site. First stain on one year old cedar decking and rail top. Sand then wash or wash first?? Deck cleaner first. Sand if needed lightly. Brighten all after and rinse well. 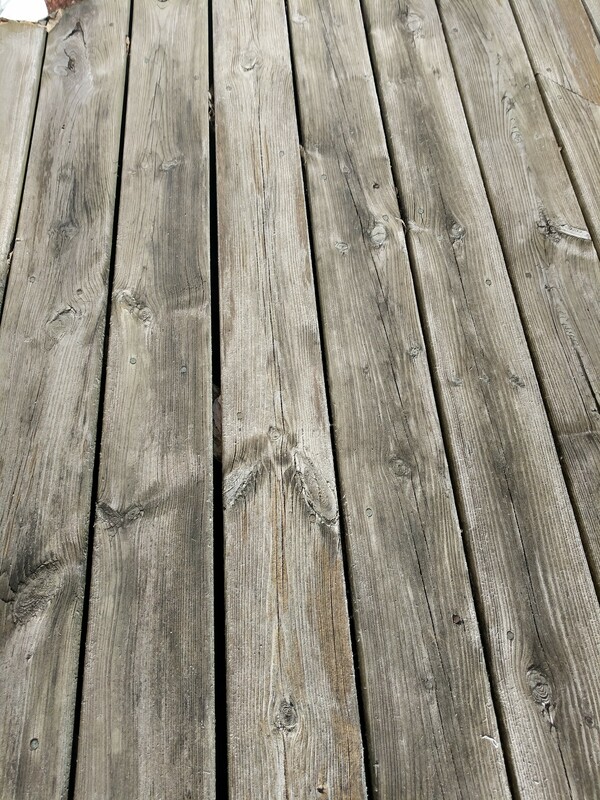 We like the natural graying but think the deck should be cleaned; what do we use? Once clean can it just be left alone to continue to graying?? Or does it need some sealing?? Prep with a deck cleaner and seal with a clear coating that allows the wood to gray naturally. Sealer must be clear with no color or tint. Look at TWP in “Clear”. I’m going to be cleaning my deck with Olympic Premium deck cleaner. Deck has never been stained or sealed since it was constructed 2.5 years ago. Monitoring the weather after the deck is cleaned, I probably won’t be able to stain deck for another 1-2.5 weeks because of the rain (and considering drying and consistent days of no rain). 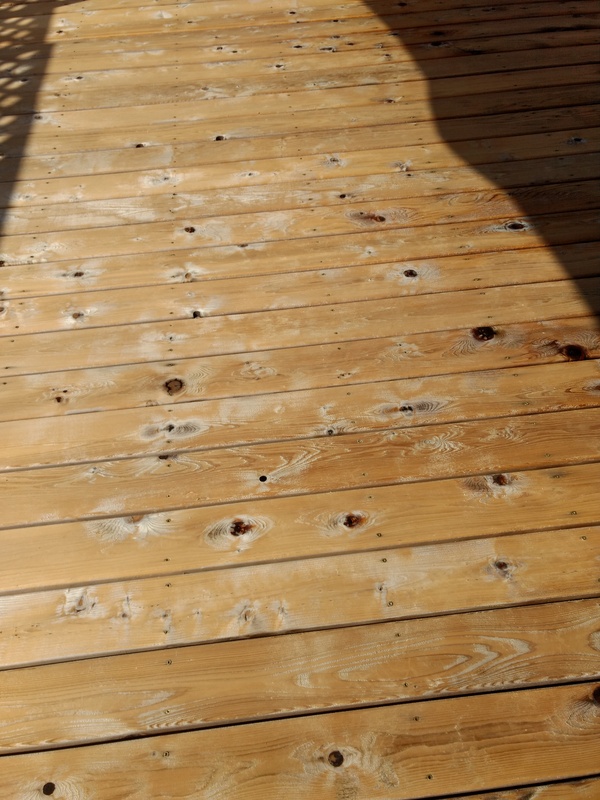 Is this okay to stain deck after 1-2.5 weeks after it has been cleaned? Yes but over 2 weeks is pushing it. May need to be recleaned. We live in Wisconsin, and have a huge deck made of pressure treated wood. Southern exposure. It has never been cleaned in about 20 years. 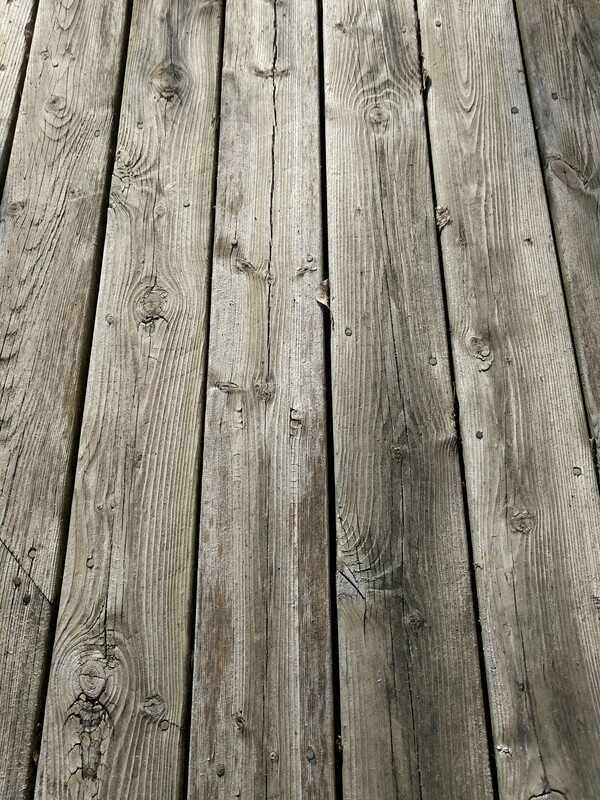 Some boards are in need of replacement, but what is the best way to clean this whole deck in the meantime? Very dark and gray. We have a pressure washer that can be used as well. Use the Restore A Deck Cleaner and Brightener kits. You may not want to do this but check what the under side of the boards look like and if they look good pull them up and flip them over and screw them down.It’s a pain knocking all those old nails out.You may need to replace some of them that don’t look good but it’s better then replacing the whole deck.I know it’s time consuming .I did my L shaped deck and it took me several weeks and 15 pounds off my body.I did have to replace some of the boards for various reasons.This deck had been on for ( and it’s a guess on my part ) about 18 years. I moved onto a house in Northern Virginia with a well worn deck. The wood seems to be in good shape but the paint/stain is peeling badly on the top surfaces. I would like to remove all the old opaque color and stain it in a way that will last. Should I sand it all off or could I power wash it off or strip it? I think the wood is pressure treated pine. You will need to sand to remove. After you sand it all off, clean and brightener for final prep. I was curious. If I am stripping a deck that was previously stained. Would I use a brightenener or cleaner afterward! Or does the stripper do all of the work and I’m ready for stain? Brightener after the stripper. Needs to be used to neutralize the stripper. Which type of deck cleaner takes the least amount of time to dry and how soon would that be? Dry? They all dry the same and that would be weather related. 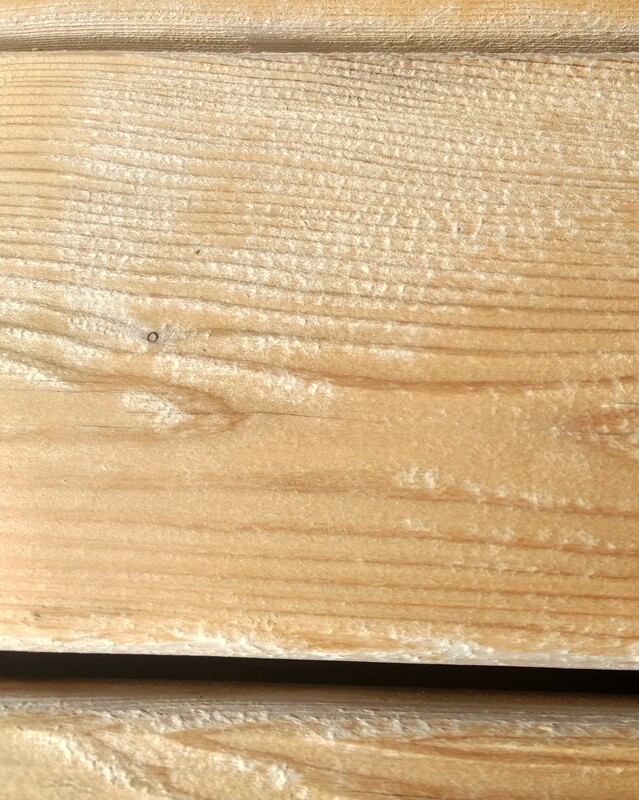 I have new deck treated wood ,first I need sanding after clean with water after need cleaning and brightener deck ,how long need to wait between cleaner and brightener, cleaner and brightener 2 in 1 its good staff or should be different? No such thing as a true cleaner and brightener in one. To do it correctly, you need the two steps. You apply the brighener as soon as you are done cleaning. We live in Maryland and have a deck/fence that receives shade in the morning and sun in the afternoon. The fence is cedar and the deck is pressure-treated lumber. 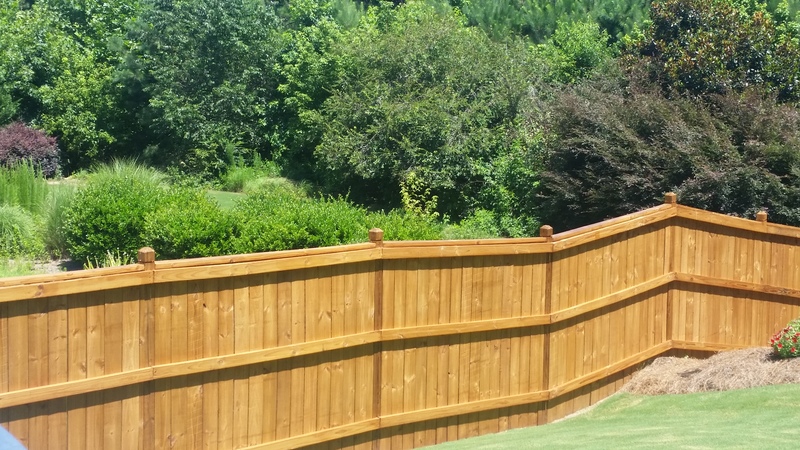 We just stained the fence with Behr transparent cedar naturaltone and the deck with Behr semi-transparent sable. I HATE it. I can’t say that we’ll be able to redo it now since it was just done, but if we redo it next year, what would you recommend? I was really hoping for more of a natural cedar look or a walnut color look (similar to the photos in the attached picture)–which definitely didn’t happen. 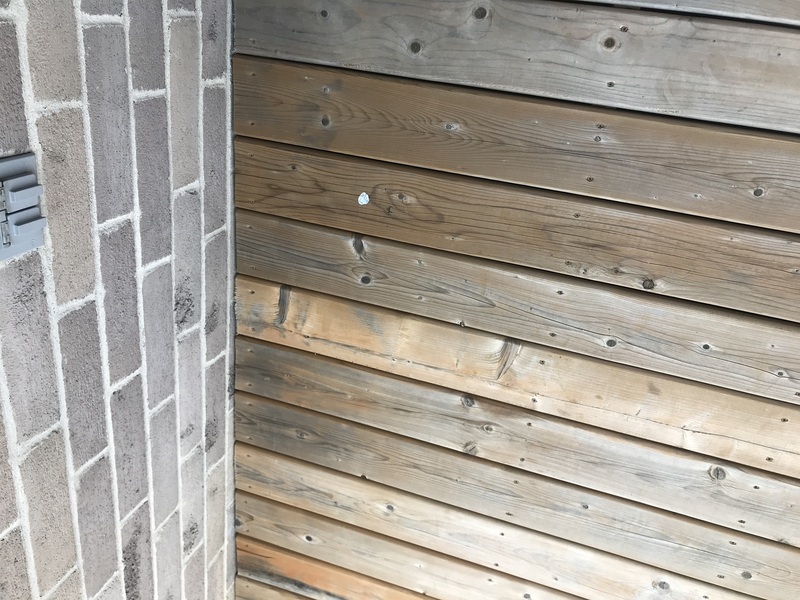 I’m not sure about mold issues because the deck is only a year old and it didn’t seem to have mold before we stained (though it does get very humid here). I suppose if you could recommend what we’d use to strip this stain next year and restain with something more pleasant that would look similar to the photos, that would be amazing! Thank you. That’s IPE wood in the 2 pictures. You cannot make PTP look like IPE wood. Closest would be the Armstrong Clark in Chestnut color. For next year you would have to strip and sand to remove the Behr. Brighten the wood afte. Thank you! As far as a stripper and brightener, is there a product that you would most suggest for getting the current product off? Behr is not an easy product to strip. It may take a few applications of stripper and even some sanding. Look at HD80 or Restore A Deck Stripper. 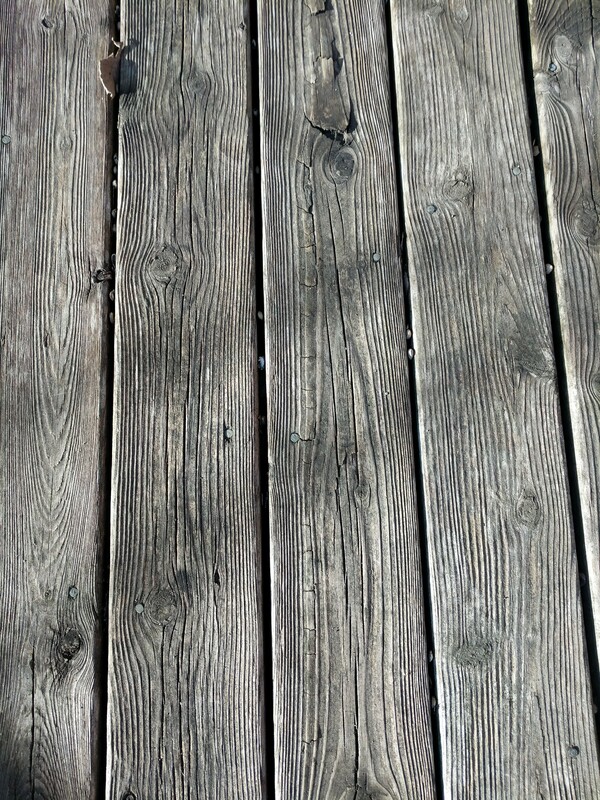 My contractor put 1 coat of Ipe oil on my new Ipe deck about 2 month ago & it already looks dull & need of a 2nd coat. Do I need to utilize both the restore a deck cleaner & brightener? Also, is this safe with my painted aluminum railing & the DYI galvanized steel sheets I installed under the deck as a the deck drainage system to keep the patio dry under the deck? Yes on both the cleaner and brightener for the prep. Should have no issues tiwh the railings, etc. I used Sherwin Williams DeckScapes a few years ago (very expensive) because I wanted to use what I assumed was the best! Wow was I wrong and severely disappointed! All that is left are areas that did not get much sun. The rest of the deck has a some patches of the stain that still remain. How do I get the rest of the Deckscapes off of my deck? Apply a stain stripper, pressure wash, let dry and sand the stubborn areas. Brighten all the wood when done. Does any of these products cause harm to trees if the rinsing is done where the root may be exposed to the solution ? We have never had any issues using prep products on 1000s of decks. It could vary though on the brand. Using dish soap and warm water good? No, you should use a deck cleaner made for exterior wood when prepping for reapplication. My dog pooped on an unpainted ipe wood and left a stain. Is there any way to get this stain out of the wood? I stained my new cedar deck with Armstrong Clark semi-transparent stain last summer. It held up fairly well over the winter. I don’t want to restain until next year. What can I use to just clean a light amount of dirt and mold that accumulated over the winter? Try warm water and some dish soap. Use a very soft brush like the ones you sue to wash your car. Nothing too aggressive as it could remove the stain.